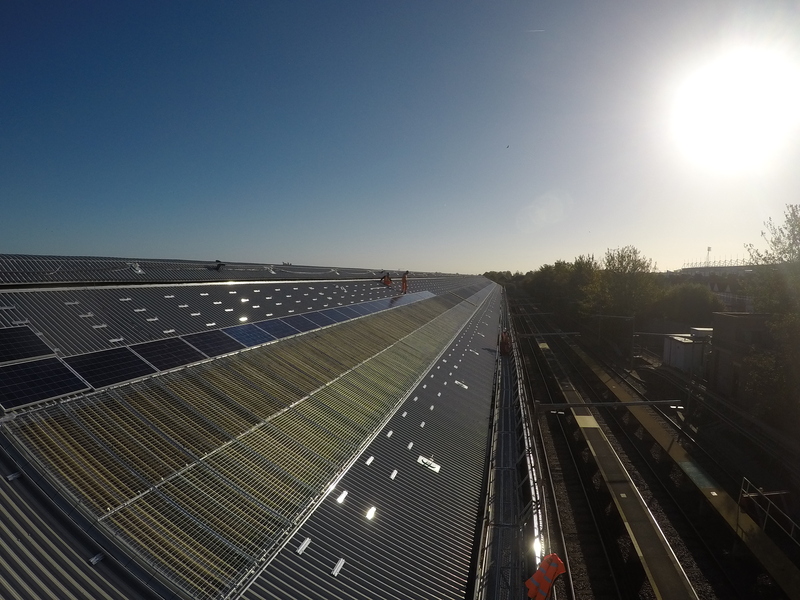 KH Engineering Services were awarded the opportunity to be the Principal Contractor for installing Solar PV panels across four railway depots on behalf of Southeastern Railway Ltd.
Southeastern required a design and build installation of intelligent solar photovoltaic panels across the roof of Gillingham depot. 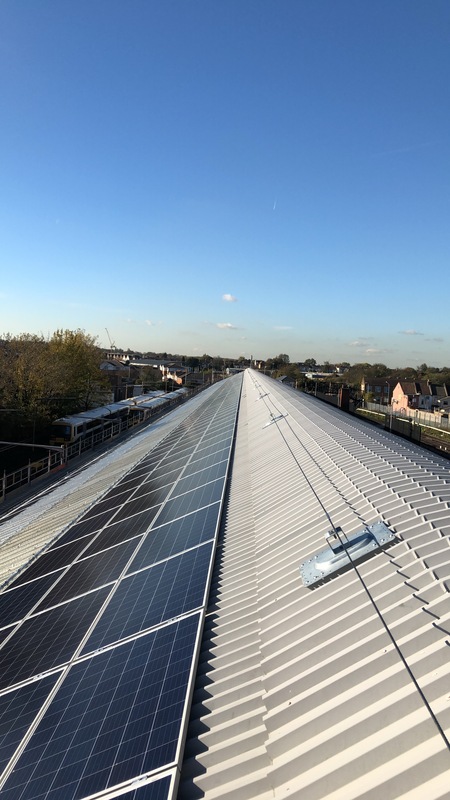 The depot is a heavy user of power and the panels subsidies the consumption, provide income through the feed in tariff when demand is low and supplement the clients green credential. The client required the works to be completed in a hostile rail environment whilst working towards a tight time-frame. The design and installation would consider future maintenance works and implement safe methods of work for PV panel upkeep. •	Edge protection & access towers. •	Installation roof light covers. •	Installation man safe system. •	Installation of 504 solar PV panels. •	Installation maintenance walking route. •	Full remote and monitoring. •	Provide training sessions and OM manual. •	The depot remained in operation during the installation. •	The project had stringent time frames. •	The steep gradient of the roof. •	Limited access for loading materials. •	Weather considerations when rainfall occurred. •	Structural issues concerning the additional weight. KH Engineering Services provided time lapse equipment to capture the project from start to finish. Additionally the client receives quarterly output reports which update the client on the health and performance of the PV panels. The reports also provides and insight into some detailed energy saving equivalents including the comparable amount of kettles boiled, equivalent vehicles removed and trees planted. 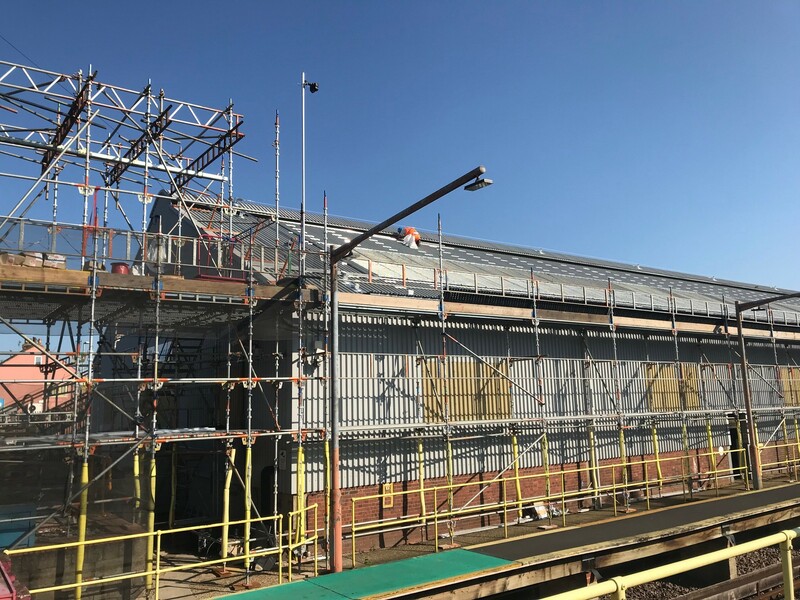 During the pre-construction phase, Gillingham Depot was considered to be the most trying installation of all four depots due to the steep roof gradient. It was also identified that Depot’s steelwork was not capable of taking the additional load of the PV panels. Extra reinforcement brackets were installed to support the steelwork. An improvement opportunity was identified which led to an increase in installation speed before the predicted bad weather conditions. 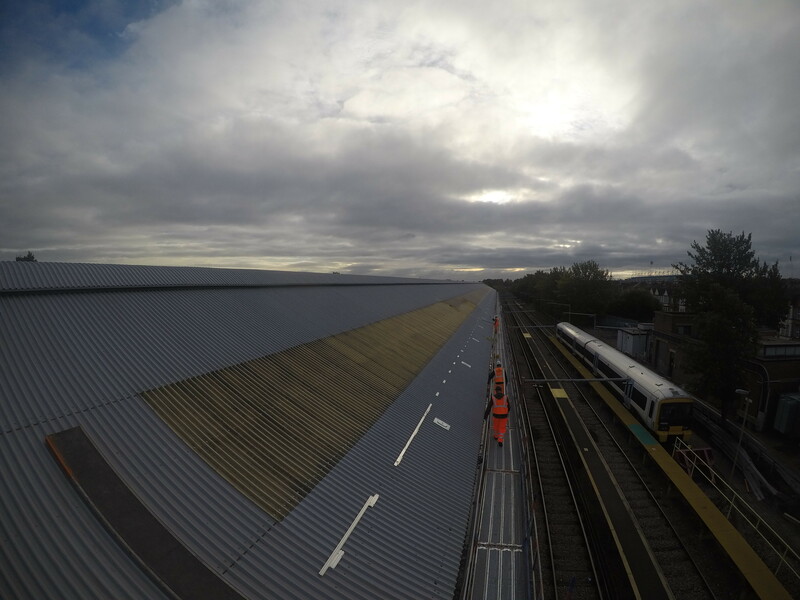 The roof light covers at Gillingham depot were received fully fabricated with no requirement for onsite assembly. 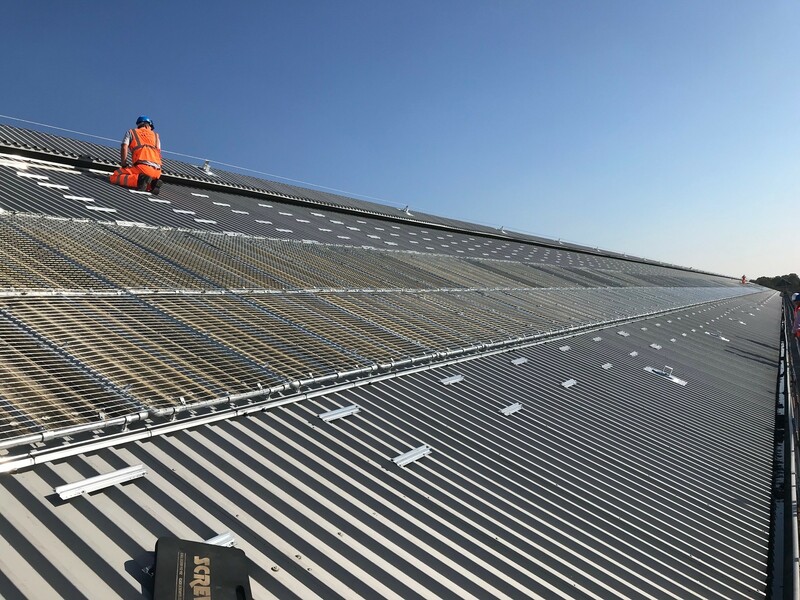 This meant the installation team were able to work a safe distance behind the installation of the roof light covers rather than wait for batches of the roof light covers to be assembled and then installed. Proactive considerations to a change in season that would see weather become unfavorable, KH Engineering Services were able to schedule tasks strategically allowing non-working roof days to be productive. As predicted, weather conditions worsened and there was a loss of installation time. A combination of rain and freezing temperatures resulted in areas of the roof being covered in ice. During these unworkable periods the installation team were able to continue with low level and electrical works including the installation of the walk way. 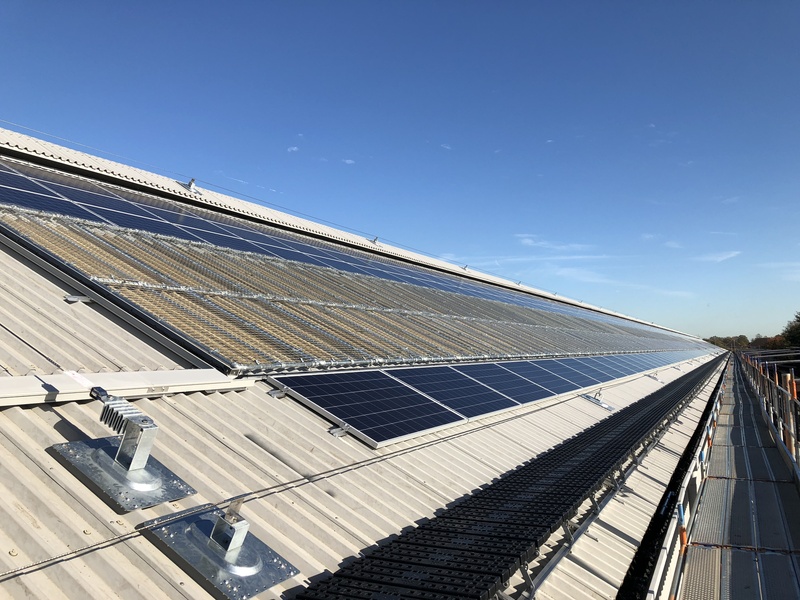 KH Engineering Services delivered the 504 Solar PV installation at Gillingham Depot with no accidents or injuries and within the programme duration allowance.